The 2016 Peace &Dignity’s Run is dedicated to “Seeds”. The Muscogee (Creek) Nation is hosting the Central Route Planning Meeting at the Tribal Complex. Our gracious co-hosts/sponsors are the Mvskoke Women’s Leadership (MWL) and the Mvskoke Food Sovereignty Initiative (MFSI). The actual meeting will occur on Saturday 9/26 and possibly Sunday 9/27 if needed. 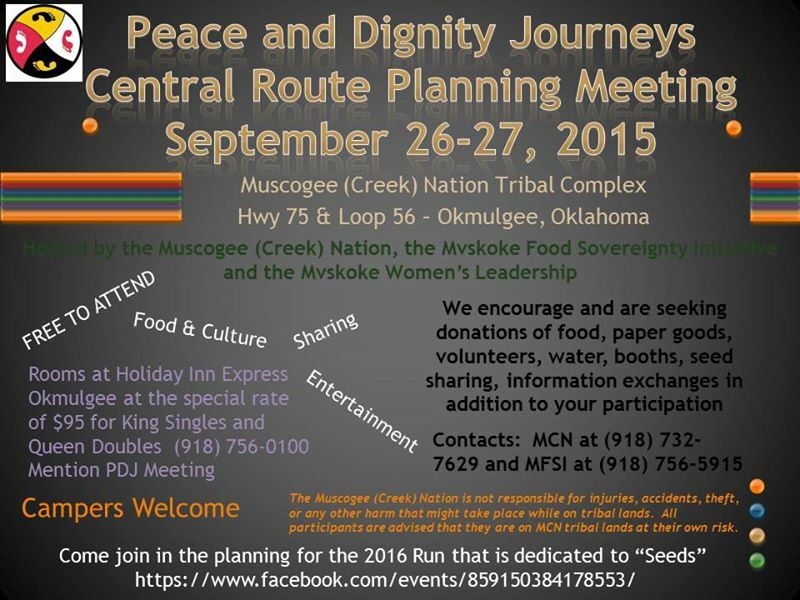 We invite everyone to come share the hospitality of the great Muscogee (Creek) Nation. We especially encourage communities, citizens, organizations, youth, churches, traditionalists, and action groups to come share the culture, the warmth and help plan this important journey for 2016. Come be a part of this incredible movement.